Before the battle the party witnessed a frightening nightmarish vision. Each of them was walking in the jungle alone, surrounded by fog, and hearing the cackling, uneasy voices of three old women. They said strange things about a child, Acererak, and the Soulmonger, and promised to keep tabs on the party, hoping the jungle will take care of them. The next day their captured goblin guide Yokka resumed leading them toward his Iron God, which appears to be Vorn, the deactivated construct Wakanga had told them about (and desires). Yokka was about to lead them in into a whole mess of zombies amid some ruins, however, claiming that sneaking through them was the quickest path. Goblins are quite sneaky, this party, not so much. Therin could’ve employed Pass Without Trace here and gotten everyone through. Instead he insisted on smashing in some zombie skulls, as he should have. Mannix’s plan was to have everyone hang back and use ranged attacks on the slow-moving zombies, which was a very solid strategy – especially because I gave them a surprise round and my zombies rolled a 1 on initiative. But like all great D&D plans, they fall apart quickly. Therin shapeshifted into a bear and charged while their goblin guide slipped his bonds and ran off, leaving the party to abandon their position and start maneuvering. Mannix and Inete ran after the goblin while the others ran forward to engage the zombies. Individually they weren’t particularity strong, though they had strange plant growths all around them. But more and more began pouring out of the jungle. 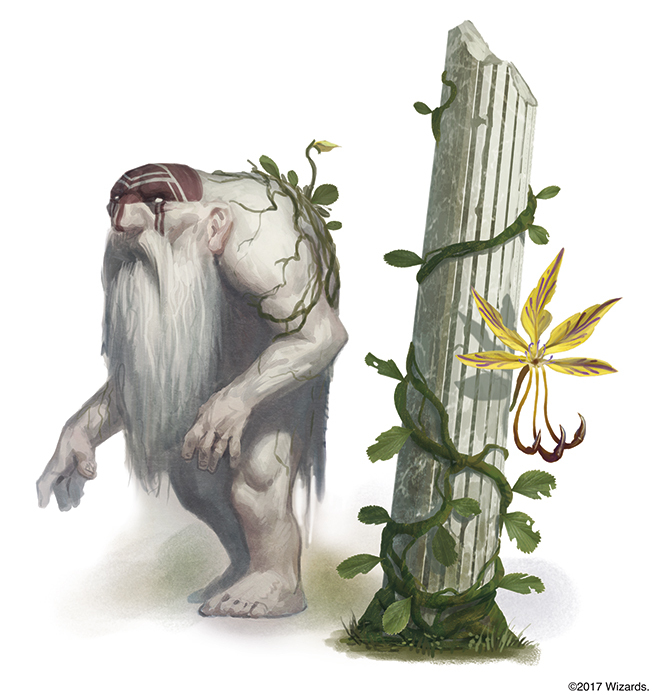 And the Therin-bear had inadvertently stumbled upon their source, an unholy flower called the Yellow Musk Creeper. The Creeper tried to send out its spores to lure nearby heroes, unsuccessfully (DC 11, boo). But it was much deadlier with its attack. Despite only a +3 attack on both it and the zombies, I was nailing some nasty blows left and right. Poor Gillian can’t ever catch a break. The hard-hitting zombies actually took out Therin’s bear form, rendering him back to dwarfness. 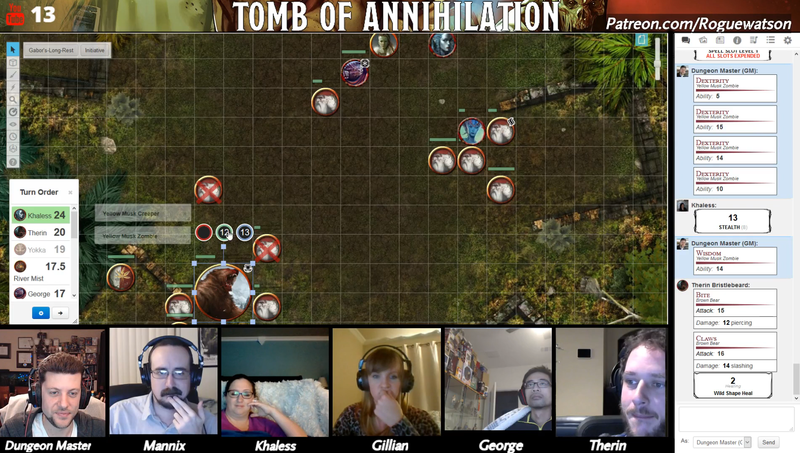 A follow-up attack was a crit and we all stared shocked at the screen as I rolled very bad damage on the double crit dice (17 dmg on 6d8), which would have killed Therin outright. Instead he was reduced to one hit point after Undril had just healed him. Oh my. Meanwhile Inete was able to catch the fleeing goblin with Mannix tying him up once again. He ordered the tabaxi to watch them and rejoined the fight. Eventually the zombies were pushed back thanks to big hits from Khaless’ crossbow, several Thunderwaves from Gillian, and whirlwind sword blades from an inspired George. Everyone turned their attention toward the deadly flower, letting Therin finally retreat, though Undril nearly perished in his absence. Volley of arrows and blades finally struck down the evil flower, with the final blow coming from a wrathful Therin and his trusty sling. The party found a bit of loot scattered around the area for their trouble, though much of the party was tired and visibly injured. They hunkered down for another short rest that evening, ready to finally make their way to the Iron God tomorrow.